This set of photos was taken at a friend's home near Annapolis, MD. The date was Thanksgiving 2013 at 5:30 PM. The "Take It!" 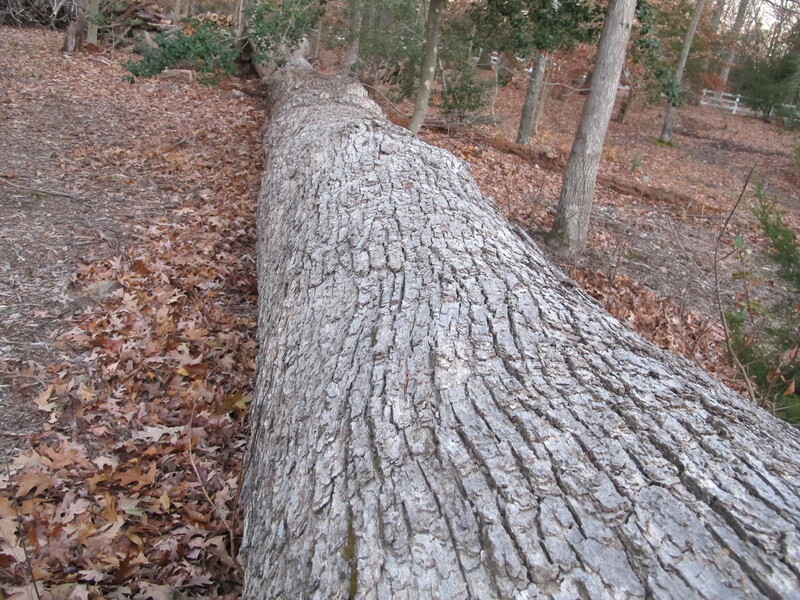 came from having my friends tell me in advance of my visit for Thanksgiving about this massive white oak having fallen during summer storm. One really doesn't get a true sense of the size of some things until they are standing next to them. 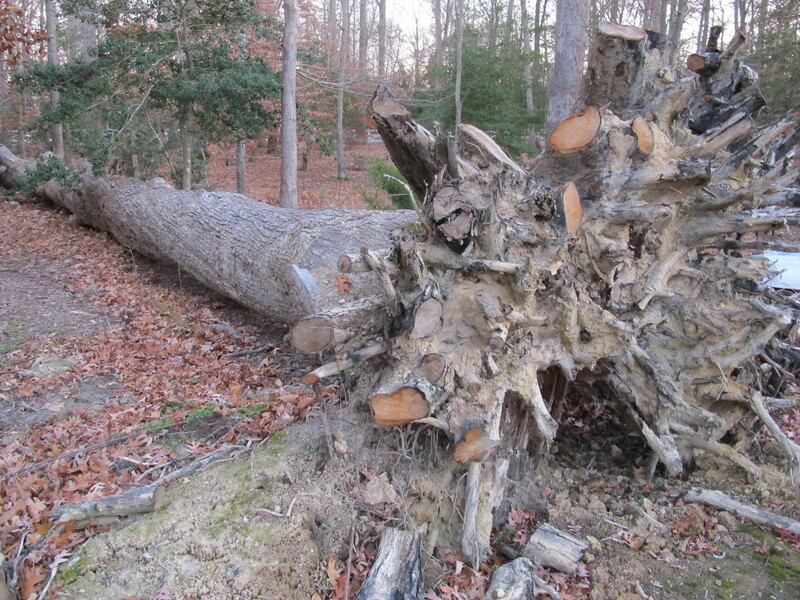 This was certainly the case with this tree that had a diameter of 42 inches at the base and was over 30 feet in length. The thing that I found quite amazing was how small the diameter of the root base was in comparison to the height of the tree. Oak trees are known for this and are a constant threat to homes when they get to be quite old and are standing near the house. Fortunately the tree fell in a direction away from the house for had it fallen the other way, it would have damaged the home severely. The After Take: to those that I showed this set of photos to - all seemed to be quite taken with the size of the tree. I am working with a wood cutter that may cut the tree up and take it away for my friends in order to be rid of it. I would take a forever to cut it up and burn it in their several fireplaces in the house - lol. Should my wood cutting contact cut up the tree into slabs - I will be there, and take some photos to share. I have more photos from this visit which I will post separately. Please keep a watch on the trees near your house for they need to be in good health and not too close to avoid damage from a fall in a storm. 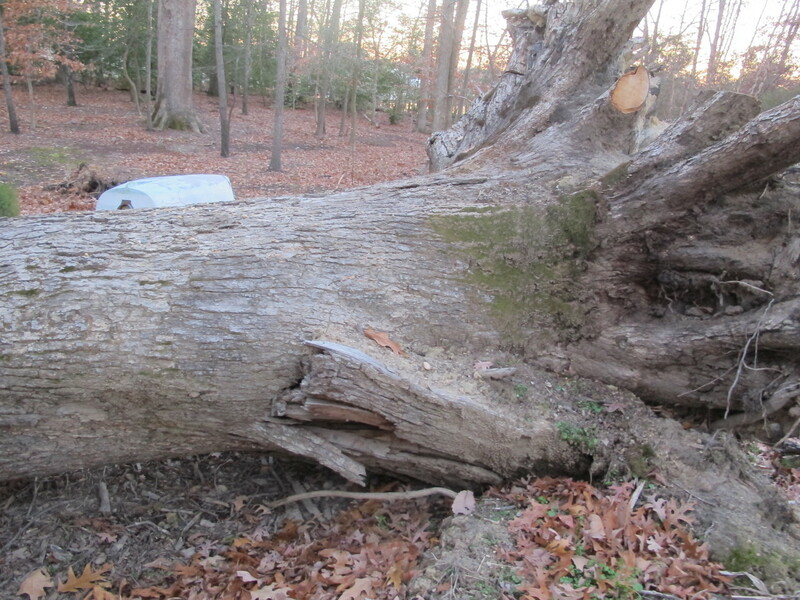 PS: If the wood cutter carves this tree up - I am going to ask for a section or two of it to make end tables and include what might be able to be cut out of the root ball for a center piece of a coffee table. Nature can be a very powerful force, equally impressive. That is a lot of wood, I hope we get to see it all cut up! Very fortunate it did not fall into the house. What a blessing; the tree is just huge! We actually had a tree take out the back corner of our garage on time. We took that happily though as the alternative was our sons bedroom. Wow! Cool shot. The roots look so cool.